If y ou haven’t already seen the event on Facebook, I’m excited to tell you we will be holding Cadance’s first workshop this April at Studio Métronome! 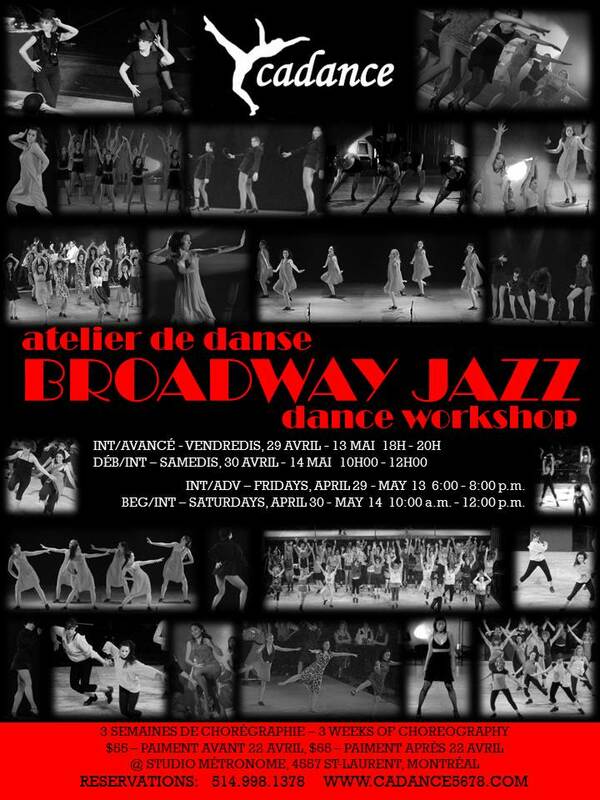 For three weeks (a total of 6 hours), we will cover some classic Broadway faves during this Broadway Jazz choreography workshop! It’s not yet set in stone, but I’m considering such musicals as West Side Story, Chicago, Cats, and Gypsy just to name a few. Again, I have not yet set the choreography, but it would be a good idea to bring knee pads to class, just in case, and your character shoes, if you have them. In class, we will do a warm-up and some across-the-floor exercises to prepare for our choreography. We will try to cover a short piece of choreography each week or so – ending with two or three short pieces over the three weeks. Intermediate/Advanced – Fridays, April 29 – May 13 6:00 – 8:00 p.m.
Beginning/Intermediate – Saturdays, April 30 – May 14 10:00 a.m. – 12:00 p.m.
Register early to save your spot and to pay the early bird price! Just in time for the warm weather, we’ll be ordering Cadance tank tops in addition to the t-shirts. The tank tops are available in most of the same colors as the t-shirts (sorry guys, but for women only). Be sure to check out the newest selection of colors – American Apparel is always changing it up! As of this writing, their wholesale website was unavailable for reference in terms of tank top colors. I referenced their retail website for that, which may be slightly different. I will update my website (for tank top color availability) as soon as possible. I will be announcing the winners for the 5 prizes at the end of this week to celebrate Cadance’s 5 years! It’s still not too late to register for the session (jazz or Pilates) to earn an entry in the drawing. Remember, you could win your session (1 prize), 50% off of your session (2 prizes), or $55 off of your session (2 prizes). Previous Post 5 Years of Cadance!